Control hardware for safety instrumented functions should be separate from the control hardware used to regulate the process, if only for the simple reason that the SIF exists to bring the process to a safe state in the event of any unsafe condition arising, including dangerous failure of the basic regulatory controls. If a single piece of control hardware served the dual purposes of regulation and shutdown, a failure within that hardware resulting in loss of regulation (normal control) would not be protected because the safety function would be disabled by the same fault. Safety controls are usually discrete with regard to their output signals. When a process needs to be shut down for safety reasons, the steps to implement the shutdown often take the form of opening and closing certain valves fully rather than partially. This sort of all-or-nothing control action is most easily implemented in the form of discrete signals triggering solenoid valves or electric motor actuators. A digital controller specially designed for and tasked with the execution of safety instrumented functions is usually called a logic solver, or sometimes a safety PLC, in recognition of this discrete-output nature. Some logic solvers such as the Siemens Quadlog are adaptations of standard control systems (in the case of the Quadlog, its standard counterpart is called APACS). 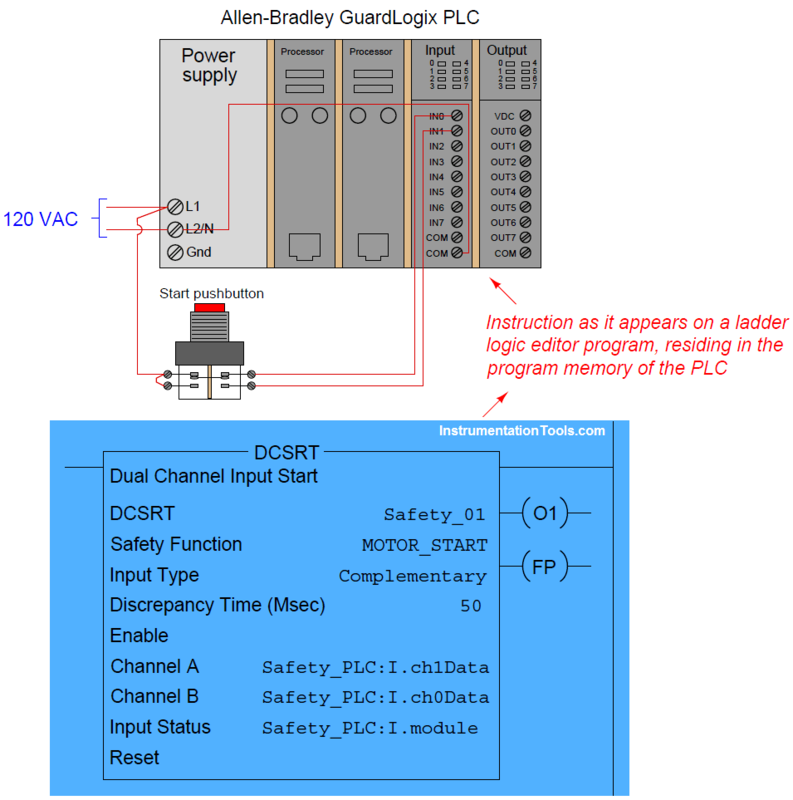 In the United States, where Rockwell’s Allen-Bradley line of programmable logic controllers holds the dominant share of the PLC market, a version of the ControlLogix 5000 series called GuardLogix is manufactured specifically for safety system applications. Not only are there differences in hardware between standard and safety controllers (e.g. redundant processors), but some of the programming instructions are unique to these safety-oriented controllers as well. In this case, the DCSRT instruction looks for two discrete inputs to be in the correct complementary states (Channel A = 1 and Channel B = 0) before allowing a motor to start. These states must not conflict for a time-span longer than 50 milliseconds, or else the DCSRT instruction will set a “Fault Present” (FP) bit. As you can see, the form-C push button contacts are wired to two discrete inputs on the GuardLogix PLC, giving the PLC dual (complementary) indication of the switch status. For specialized and highly critical applications, dedicated safety controllers exist which share no legacy with standard control platforms. Triconex and ICS-Triplex are two such manufacturers, producing triple-modular redundant (TMR) control systems implementing 2oo3 voting at the hardware level, with redundant signal conditioning I/O circuits, redundant processors, and redundant communication channels between all components. The nuclear power industry boasts a wide array of application-specific digital control systems, with triple (or greater!) 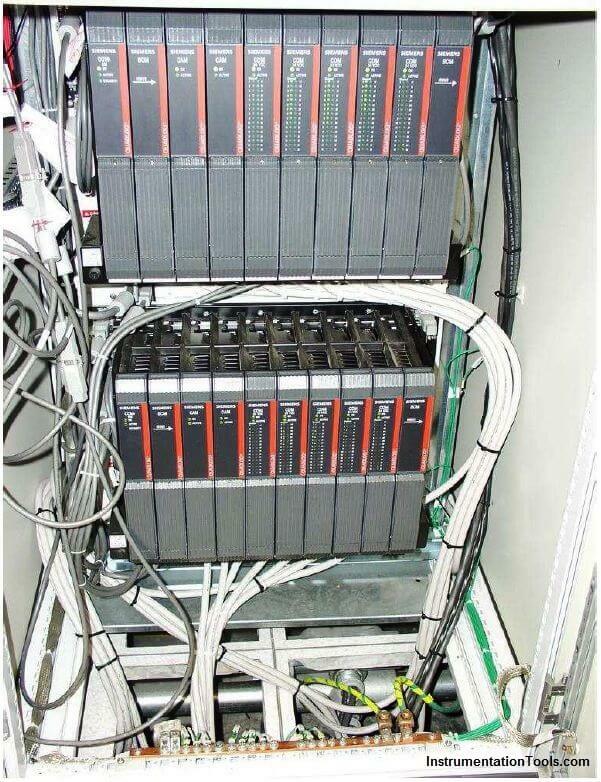 component redundancy for extreme reliability. An example of this is Toshiba’s TOSMAP system for boiling water nuclear power reactors, the digital controller and electro-hydraulic steam turbine valve actuator subsystem having a stated MTBF of over 1000 years! 44MTBF stands for Mean Time Between Failure, and represents the reliability of a large collection of components or systems. For any large batch of identical components or systems constantly subjected to ordinary stresses, MTBF is the theoretical length of time it will take for 63.2% of them to fail based on ordinary failure rates within the lifetime of those components or systems. Thus, MTBF may be thought of as the “time constant” (τ) for failure within a batch of identical components or systems. What is Distributed Control Systems (DCS) ? What is Process Override Switch (POS) ?